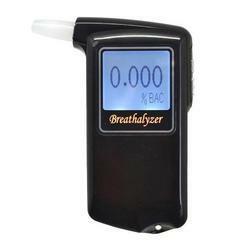 Alcohol Breath Analyzer is the most common method of testing for blood-alcohol content in use today. Ultramind breath analyzers estimate the concentration of alcohol in the body by measuring the amount of alcohol exhaled from the lungs. The hand held analyzers have digital display, these are easy to use and provide accurate readings. The device can also be connected to the computer for logging data and a compact sized printer to print out the details of alcohol concentration,date and time. 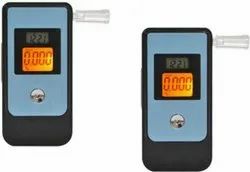 Now a days, Alcohol Breath Tester are widely used by Traffic Police, Industries, Railways, Airports & Airlines, Military, Factories & Offices, Hotels & Restaurants, BPOs, MNC’s,Security companies, Bus & Taxi operators, educational institutions, laboratory, Personal etc. This is a portable alcohol tester which is safe and sensitive.Inspecting user's blood alcohol concentration by testing user's breath. Digital display indication. We are specialists in breathalyzer sales and alcohol testing advice to companies and individuals requiring accurate, reliable breathalyzer units. 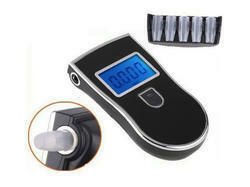 Product Description: We offer a wide range of Alcohol Breath Tester. 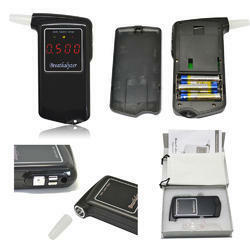 It is a kind of tester designed to measure concentration result of the breathed alcohol in the human body. 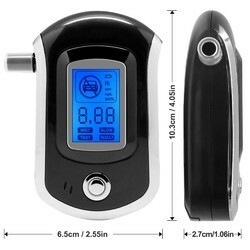 This device adopts advanced flat surfaced alcohol sensor which has excellent sensitivity and reproducibility, fashionable and portable design make it more convenient for personal use. When the alcohol content exceeds the present limited level, this device would send an audio and video warning to remind your safety. This is a professional police digital breath alcohol tester and High quality and high accuracy and sensation, can respond in 5sec With the port to insert mouthpiece and Health and convenience. Rapid detect results, quick response and resume. High accuracy, detection range: 0.000-0.199% BAC / 0.00-1.99? BAC / 0.00-0.99 mg/L. Easy to use, Light weight. With a bag for it,easy to carry. Detection range: 0.000-0.199% BAC /0.00-1.99? BAC / 0.00-0.99 mg/L. Product Description :Compact, fast and reliable, designed with functionality in mind, this alcohol tester fits into every pocket. The tester is extremely easy to use, providing quick and reliable results.This equipment uses an air sensor tested by the industry, similar to the testers used by traffic police.The alcohol sensor performs has a self-test function, checking it is in working order and ensuring that you receive precise results every time. 3.Three LCD display,apart display 0.02ºC and 0.05ºC. 8.It has LCD backlight and Key Chain. Alcohol Breath Tester, MT05 Model, is commonly used at home, bar, laboratory, Police, Military and Airport or while you are on the road Device provided with extra mouthpieces for convenience. Units activated through a micro switch, after a brief internal self test; the test subject blows through the sensor and result are converted and read within few sec. Gives out audible sound alarm if you above the drink drive limit. Can be used with or without the mouthpieces supplied. Battery saving design, low voltage indication. Powered by 9V alkaline battery or from your car cigarette lighter socket using the 12V DC adapter (included). Circling testing: less than 30 seconds. Indication: 4 digital LCD with status. Power supply: 6LR61 9V alkaline battery or 12V DC adapter. Battery available for standard testing time 100 times. Operation: 15°C - 35°C 80% RH. Weight: @141g (including 6LR61 9V battery). Note : All Debit/Credit Cards accept here for your handsome purchasing. Size: 118mm x 68mm x 29mm. Alcoscan AL6000 is a hand held, portable breath alcohol tester to check subject's breath alcohol concentration with reliable accuracy and it is available to test in Passive mode. 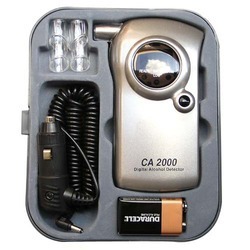 We are offering a wide range of Alcohol Breath Tester.These breath tester CA 2000 is a superb hand held, portable and use friendly digital breath alcohol tester to check subjects Breath Alcohol Concentration (BAC) with reliable accuracy and easy to use.This is one of our best value breathalyzer.It displays the breath alcohol concentration as 3 digit.Certified by the US food drug administration (FDA) the unit also meets US Department of Transport (DOT) requirement. It is filly useable in the UK and Europe displaying a clear no nonsense digital numeric readout. displaying in C.Certified by the US food and drug administration (FDA), the unit also meets US Department of Transport (DOT) requirements. It is fully useable in the UK and Europe displaying a clear no nonsense digital numeric readout. Power Supply 1 x 9V Duracell Supplied. Dimensions (mm)126mm Height x 60Width x25 Depth. Note: All Debit/Credit Card Accept here for purchasing. 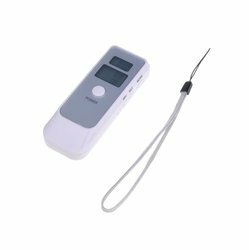 Product Description :Alcohol breath tester, alcotest-1 model, is commonly used at home, bar, laboratory, police, military and airport or while you are on the road device provided with extra mouthpieces for convenience. units activated through a micro switch, after a brief internal self test; the test subject blows through the sensor and result are converted and read within few sec. use high precision and sensitive semiconductor sensor. 2.0’ lattice black and white screen with digital display. 3 test unit (ºc, º c, mg/l) to be selected. the number of tests may be display. 1. sensor type : semiconductor alcohol sensor. 2. measurement range : 0.000~0.199% bac; 0.000~1.990ºc; 0.000~0.995mg/l (brac). 3. warm up time : 10s. 4. accuracy : 0.010% bac. 5. power input : 3 aaa alkali batteries. 6. working temperature : 00c ~ 550c. 7. init dimensions : 125mm x 68mm x 24mm. 8. unit weight : approx.75g. 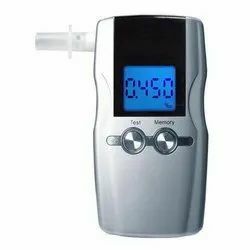 The Breath Alcohol Analyzer ST-2000 Pro is a superb value hand held digital alcohol detector which is accurate and easy to use.A good choice for individuals requiring high level accuracy and This is one of our best value breath analyzers. No mouth piece is required, you can blow direct to breath analyzer. It displays the breath alcohol concentration as a 3 digit readout in mg/l unlike other ST 2000 Pro models displaying in % BAC. The S80 is easy to use - insert the two AA batteries that come with the product, and it's ready to test. 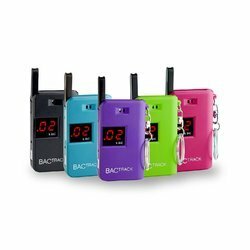 When you press the start button, the BACtrack S80 counts down for approximately 10 seconds, preparing the system for a breath sample. When the countdown reaches zero, blow steadily and continuously for at least 5 seconds. If a sufficient breath sample has been taken, the user's estimated BAC is displayed on the screen. Reliable Performance, Accurate ResultsDespite its small size, the BACtrack S80 packs serious technology inside its black plastic casing. There is a miniature air pump inside the S80 that activates at the end of each breath sample. You can actually feel the 'click' during each test. This proprietary internal sampling system ensures that a precise breath sample enters the alcohol fuel cell sensor, and is one of the reasons why the S80 provides trusted, accurate results every test. 3 test units (mg/L, mg/100ml, etc) to be selected by user. Ambient conditions Storage: -10 to 50??? / operation: 5 to 40??? 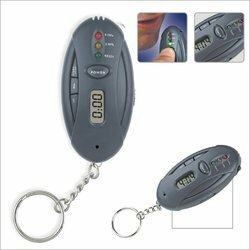 Product Description : Compact, fast and reliable, designed with functionality in mind, this alcohol tester fits into every pocket. The tester is extremely easy to use, providing quick and reliable results.This equipment uses an air sensor tested by the industry, similar to the testers used by traffic police.The alcohol sensor performs has a self-test function, checking it is in working order and ensuring that you receive precise results every time. A simple and quick method to analysis blood alcohol concentration at anytime, anywhere. Count-down or count-up timer keep you alert the deadline of your parking and so on. Super bright orange LED flashlight, help you to find the key hole of your car in dark etc..
Portable and convenient to carry aroud with keychain. Production Description :The breath analyzer is professionally designed and built by high technology DSP micro processor using semi conductor and fuel cell sensor. It can provide you with immediate accurate blood alcohol contents (BAC) in your body. It can be used at station, office, company, BPO, medical institute and personal use. We have various models in this range with/without printer.The alcohol concentration with date and time can be printed through mini printer with printer model.Alcohol Breath Analyzer PT-101 has 2.4” display with 0.001?C resolution. Auto flow detects to monitor the continuous breath sampling and air-exit cleaning, Advance calibration function Real time clock in 12/24 hour format. MT 10 has rechargeable /interchangeable battery (NOKIA standard. Build in DSP microprocessor technology and CE approval by FIMK. Power source: 3 X 1.5V AA regular batteries or rechargeable batteries or get the power supply from the cigrate lighter socket in car. Blowing time:4 to 5 seconds continuously. Calibration:Availed upon request(every 12 months). 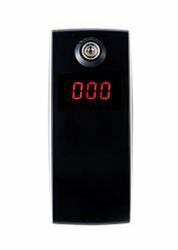 Removable mouthpiece, easy to clean and replace.Breath Tester used as a monitor, it can indicate when equivalent blood alcohol percentages are below or above the legal limits. 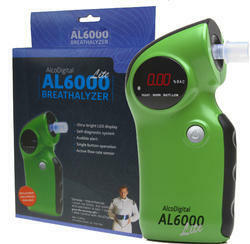 ALCOSCAN AL5500 is a convenient, easy-to-use breathalyzer. It combines the quality of a professional grade device with the convenience of portability and simplicity. ALCOSCAN AL5500 features single-button operation, a bright 2-digit LCD display and re-useable mouthpieces. The cumulative test count and previous test result will be displayed alternately as you hold the power switch down. 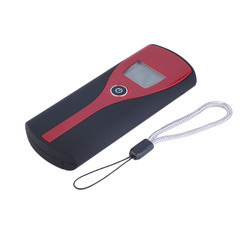 Product Description :This is a portable alcohol tester which is safe and sensitive.inspecting user's blood alcohol concentration by testing user's breath. digital display indication. 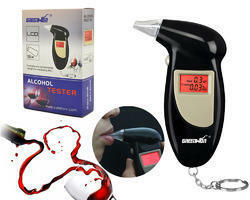 We offer a wide range of Alcohol Breath Tester. 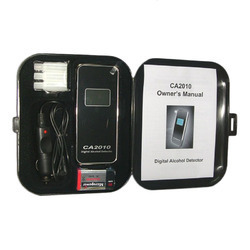 CA2010 Pro is a superb value hand held digital alcohol detector which is accurate and easy to use. A good choice for individuals requiring high level accuracy. Certified by the US food and drug administration (FDA), the unit also meets US Department of Transport (DOT)requirements. It is fully useable in the UK and Europedisplaying a clear no nonsense digital numeric readout. The Alcohol Breath Tester is commonly used at home, bar, laboratory, Police, Militry, and Airport or while you are on the road Device provided with extra mouthpieces for convenience. Units activated through a micro switch, after a brief internal self test; the test subject blows through the sensor and result are converted and read within few seconds. _ Power source : 9V NI MH Rechargeable battery. _ Blowing time : 4 to 5 seconds continuously. _ Calibration : Availed upon request (recommended every 12 months). _ Removable mouthpiece, easy to clean and replace.